 Rivera appeared in the film Sparkle (2012) as Hussy A Los Angeles woman fled onto her roof when a transient broke into her home Wednesday and terrifying photos have revealed how close the intruder came to finding her. 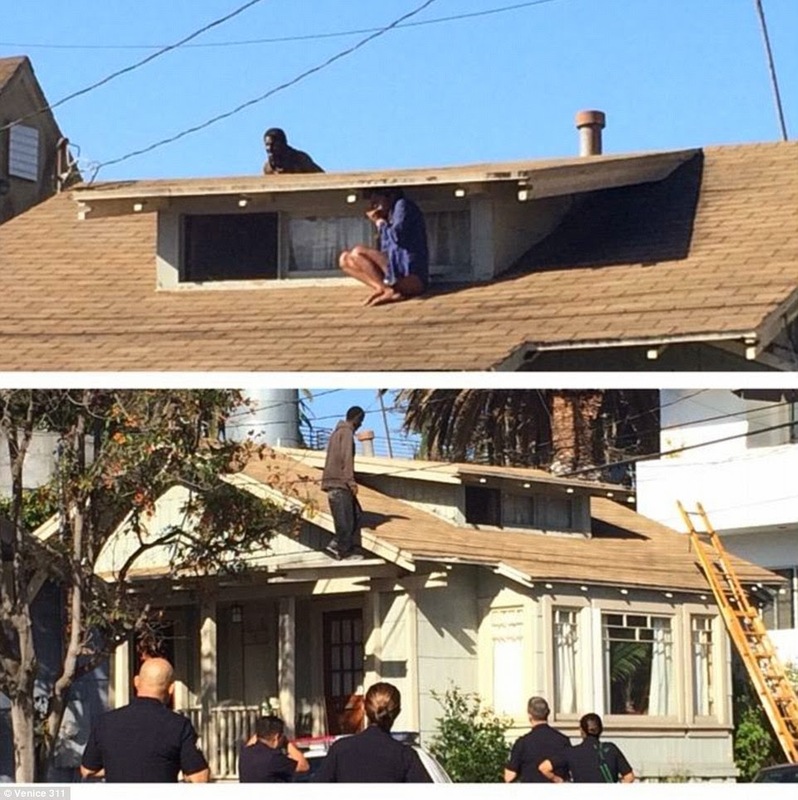 Melora Rivera bravely crawled onto her Venice roof and had the wherewithal to take her cell phone and call police. 'Once I saw him in the house, I knew that we both couldn’t be there,' Rivera told CBS LA from her Venice home. Police arrived on the scene just minutes after Rivera's frantic call as she hid beneath an eave of the roof. 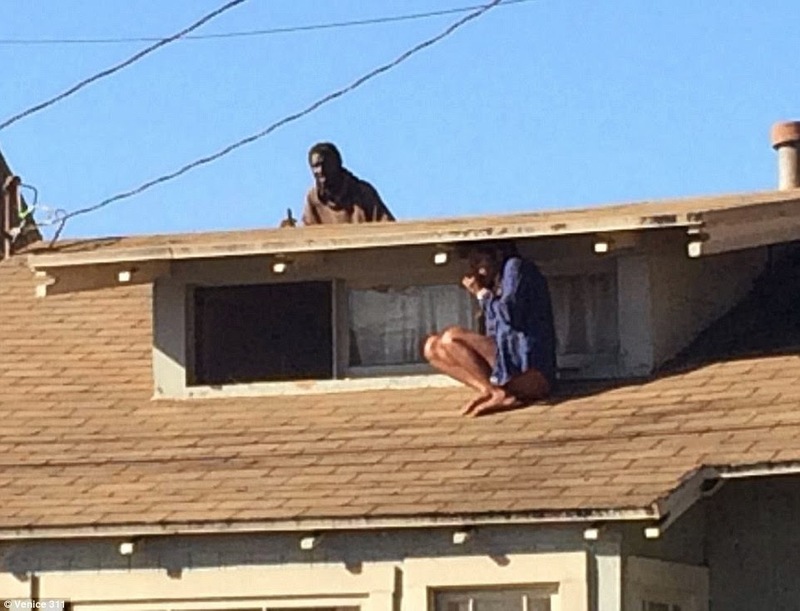 An area blogger snapped a photo just as the itinerant, later ID'd by police as 29-year-old Christian Hicks, lurched onto the roof behind her. It was a moment borne of nightmares. But brave Rivera kept her composure. 'I knew that I didn’t want to have a confrontation with him of any sort, you know, not knowing what his intention was,' she told CBS LA. In spite of her composure, Rivera--who works in showbiz and had a small role the 2012 Whitney Houston film Sparkle--revealed that she did have at least one overarching fear as she clung to the roof. 'It was my biggest fear was that he was going to be forced by the cops to come hide in basically the same place I was hiding,' Rivera said. Lucky for her, that didn't happen. 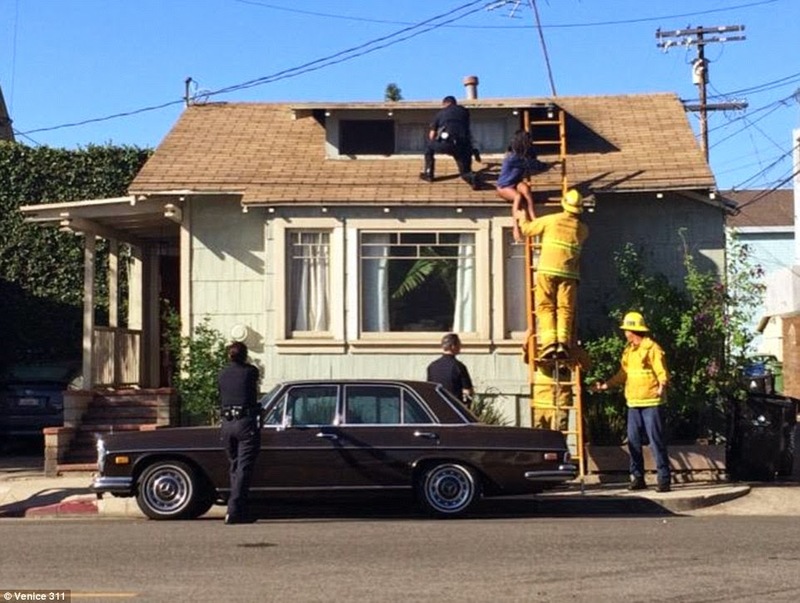 Police managed to coax the intruder down after giving Rivera a ladder on which she could climb to safety. Even as Rivera was still reeling Wednesday from the experience, she worried for people like Hicks in her neighborhood. Eye witness Craig Miller said: 'I was driving my car to work and just happened to look over to my left and saw this person kicking in the front door to a house, obviously I knew something was wrong, I turned around to get the address and call 911 to report it and I just happened to see an LAPD car at the stop sign so I flagged them down and told them what was going on. 'The next thing I know these guys are surrounding the house and there's a female up on the roof. 'What is amazing is that I happened to see it and there just happened to be an LAPD car right there. Who knows what could have happened to that girl otherwise. Alex Thompson, who runs neighborhood watch website Venice311.org, heard the call out on the police scanner. She told MailOnline: 'I heard a call come out for a burglary, a burglar had entered a home. I was on my way to the bank and the address was on the way so I went down there. 'As I come around the corner and I look up and there's this half naked girl cowering underneath the awning and the police have their guns drawn. 'I stood there with some other residents and we thought she was the burglar up on the roof not listening to the officers' commands. 'I took my camera phone out and started taking pictures, then all of a sudden this horrifying dark figure pops up on the other side of the roof and everybody on the other side of the street was like, 'oh no', it was the scariest Jack in the box, freak show, weird situation. Eagle-eyed Alex - who often patrols Venice on her bike listening to her scanner - says other residents revealed they recognized the man as someone in cuffs earlier that morning. Others told Alex they had called the cops to report the guy in their yard. But Alex said: 'That's the problem, the people who called on him don't press charges. 'The police stopped him earlier that day and called the home owners back and said "we need you to do a field show up to identify him", but oh no they couldn't be bothered.